We propose that dorsal anterior cingulate cortex (dACC) and anterior insula (AI) project to lateral habenula (LHb) and D2 loop of ventral striatum (VS). They form functional adversity processing circuit directed toward inhibitory avoidance and self-control. This circuit learns what is bad or harmful to us, evaluates and predicts risks - to stop us from selecting and going/moving for the bad or suboptimal choices that decrease our well-being and survival chances. Proposed role of dACC is to generate a WARNING signal when things are going (or might end) bad or wrong, to prevent negative consequences: pain, harm, loss or failure. The AI signals about bad, low, noxious and aversive qualities, which might make us sick or cause discomfort. These cortical adversity processing regions activate directly and indirectly (via D2 loop of VS) the LHb, which then inhibits dopamine and serotonin release (and is reciprocally inhibited by VTA/SNc, DRN and MRN) to avoid choosing and doing things leading to harm or loss. Overstimulation of this circuit makes us feel worse, even down. We propose that dopamine attenuates output of the adversity processing circuit, thus decreasing inhibitory avoidance and self-control, while serotonin attenuates dACC, AI, clOFC, D1 loop of VS, LHb, amygdala and pain pathway. Thus, by reciprocal inhibition, by causing dopamine and serotonin suppression - and by being suppressed by them, the adversity processing circuit competes with reward processing circuit for control of choice behavior and affective states. We propose stimulating effect of dopamine and calming inhibitory effect of serotonin on the active avoidance circuit involving amygdala, linked to threat processing, anger, fear, self-defense and violence. We described causes and roles of dopamine and serotonin signaling in health and in mental dysfunctions. We made new idea that ventral ACC activation signals well-being /that we are doing well/, and that vACC attenuates dACC and stimulates serotonergic dorsal raphe nucleus /DRN/, when we gain/reach safety, comfort, valuable resources (social or biological rewards), affection and achieve goals. We propose that dorsal anterior cingulate cortex (dACC), anterior insula (AI), and adjacent caudolateral orbitofrontal cortex (clOFC) project to lateral habenula (LHb) and D2 loop of ventral striatum (VS), forming a functional adversity-processing circuit (APC), directed toward inhibitory avoidance and self-control. This circuit learns what is bad or harmful to us and evaluates and predicts risks – to stop us from selecting and going/moving for the bad or suboptimal choices that decrease our well-being and survival chances. The proposed role of dACC is to generate a “warning” signal when things are going (or might end) bad or wrong to prevent negative consequences: pain, harm, loss, or failure. The AI signals about bad, low, noxious, and aversive qualities, which might make us sick or cause discomfort. These cortical adversity-processing regions directly and indirectly activate (via D2 loop of VS) the LHb, which then inhibits dopamine (DA) and serotonin release (and is reciprocally inhibited by ventrotegmental area/substantia nigra compacta [VTA/SNc], dorsal and median raphe nucleus [DRN, MRN]) to avoid choosing and doing things leading to harm or loss, and to make us feel worse or even down when overstimulated. 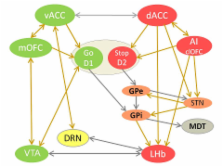 We propose that DA attenuates the output of the APC, thus decreasing inhibitory avoidance and self-control, while serotonin attenuates the dACC, AI, clOFC, D1 loop of VS, LHb, the amygdala, and pain pathway. Thus, by reciprocal inhibition, by causing DA and serotonin suppression and by being suppressed by them, the APC competes with the reward-processing circuit (RPC) for control of choice behavior and affective states. We propose the stimulating effect of DA and the calming inhibitory effect of serotonin on the active avoidance circuit involving the amygdala, linked to threat processing, anger, fear, self-defense, and violence. We describe the causes and roles of DA and serotonin signaling in health and in mental dysfunctions. We add new ideas on the role of the ventral anterior cingulate cortex (vACC) in signaling that we are doing well and in inducing serotonin, when we gain/reach safety, comfort, valuable resources (social or biological rewards), affection, and achieve goals. How do you feel--now? The anterior insula and human awareness. One hypothesis concerning the human dorsal anterior cingulate cortex (ACC) is that it functions, in part, to signal the occurrence of conflicts in information processing, thereby triggering compensatory adjustments in cognitive control. Since this idea was first proposed, a great deal of relevant empirical evidence has accrued. This evidence has largely corroborated the conflict-monitoring hypothesis, and some very recent work has provided striking new support for the theory. At the same time, other findings have posed specific challenges, especially concerning the way the theory addresses the processing of errors. Recent research has also begun to shed light on the larger function of the ACC, suggesting some new possibilities concerning how conflict monitoring might fit into the cingulate's overall role in cognition and action. Copyright statement: © 2014 K. Vadovičová and R. Gasparotti. My comments to Dr Digvijay Rana review: 1. The paper provides sample of 108 referenced evidences, in addition few mental disorders and their circuit-based mechanisms are showed as important evidence for proposed affective circuit connectivity and properties. 2. The majority of literature data on value-based decision making are in agreement with the proposed ideas. Some evidence is from anatomical connectivity, some from functional studies, some from mental disorders involving dopamine and serotonin dysfunctions. This is theoretical paper which combines any kind of available data on dopaminergic and serotonergic system in humans. It is not a review paper. and there is no space for reviewing all the evidence. Just the sufficient information to show how the affective circuit works. 3. There was no space to add suggested facts into our paper, possibly we can elaborate our simple circuit in future. 4. This paper does not include secondary intracellular cascades, neither transcription factors and control of gene expression. I have no training in cellular neuroscience, my field is decision making, prefrontal cortex functions and value-based control of human behaviour. The paper gives sufficient evidence for the predictive power of proposed ideas and serves as useful functional map for more targeted drug development in psychopharmacology field. . Author's response to the Reviewer's comment that "Depressed patients with presumably low serotonin levels have frequently addictive behaviours with presumably low ARC finding and total absence of inhibitory avoidance." The Reviewer's line is not in contradiction with our circuit based model of affective processing. We proposed that low serotonin in the brain causes disinhinbition of motivational D1 loop of ventral striatum, leading to impulsive choice of immediate rewards in spite of negative consequences linked to them (for example loss of health, relationships and money). Depressed people have low dopamine baseline, so only the most strongly rewarding choices are strong enough to win in the ventral striatum over the overstimulated D2 loop linked with inhibitory avoidance output. The inhibitory avoidance in depressed people supresses the hope, motivation, drive and amount of initiated activities to the extent that some don't see any hope to stand up in the morning and go for something what might bring jo and ease their current deprived state. Dopamine and serotonin modulate the onset of metamorphosis in the ascidian Phallusia mammillata. Opioid-induced rewards, locomotion, and dopamine activation: A proposed model for control by mesopontine and rostromedial tegmental neurons.